One of my main goals in my first year at Highbury Grove has been to review the curriculum and make the changes necessary for September 2015. I’m really pleased with the process and the outcome; parents, governors, staff and students have all influenced the thinking through various consultation processes. I described some of this in earlier post: The Trivium and the Baccalaureate: The flesh and the bones of a great education. Two sets of ideas that link together superbly. The Baccalaureate model is set for Launch in the Sixth Form from September and our Trivium thinking is being embedded gradually, reinforced by some new thinking about Assignments which specify the Knowledge, Exploration and Communication elements students will encounter in each unit of work. Every student should have access to the same opportunities: no bands or streams should limit opportunities for some students. Everyone should study languages, humanities and arts for as long as possible as they form key components of the cultural capital all children need to acquire: they’re compulsory options at KS4. Essentially we have an ‘EBacc’ for all curriculum – except that ours includes Arts as well. This is what we believe in; it’s got nothing to do with league table measures. Core subjects are important but they can’t swamp the need for a wider curriculum – even if accountability measures favour that – so we’ve held on to four options, not limited them to three or cut back the time. 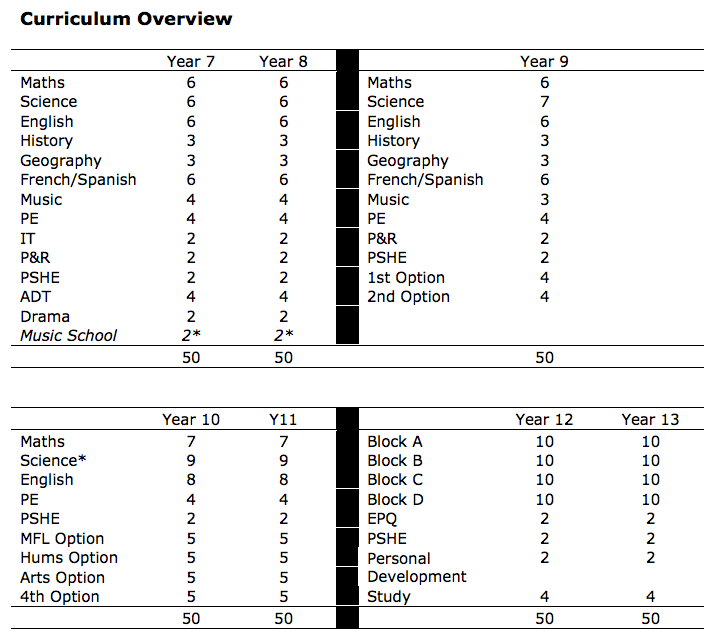 Year 7 and 8 can be standard for all but not everyone has to do the same subjects beyond that. We’ve devised some interesting courses in the Year 9 Options. All students are expected to sign up for at least one extended-day Enrichment activity; the range of options is not shown here. Music School is for students who opt in; this gives them three hours of music on a particular day for an intense learning experience based around individual tuition and ensembles. P&R is Philosophy and Religion – reflecting our approach to teaching RE. Triple Science is delivered through extended day provision; students have to commit to studying an hour per week after school – it’s been a popular choice. We have a wide range of A Level and BTEC options in the Sixth Form delivered at our school and through a consortium with three other Islington schools: IC6. Latin: The Year 9 Latin course will be mostly focused on grammar and translation along with elements of history such as Roman sacrifice, Roman and British forts, the destruction of Pompeii, an introduction to Roman Egypt and a focus on the city of Alexandria. Computer Programming: The course aims to teach students the key programming concepts behind all of the popular computer and mobile applications that are used today. Media: You will be given the opportunity to make your own magazines, films, animation, news and radio. You will learn skills such as storyboarding, filming, editing and use a wide variety of software tools such as iMovie, icananimate, Photoshop and InDesign. Business and Enterprise: For the enterprise project, students will work in teams with Arsenal to develop a strategy to encourage more families to go to games. It includes a tour of the stadium. The ‘Enterprise in a Box’ project will challenge students to make a profit from a box of products while the purpose of Social Enterprise is to raise money for the schools that we work with in Addis Ababa. Drama: Drama in year 9 gives students the opportunity to work on a scripted play and create a devised performance. This course allows students to develop their creativity and explore current issues and learn how to be a theatre critic. BTEC Sport: The Edexcel BTEC Level 1/Level 2 First Award in Sport has been designed primarily for young people aged 14 to 19 who may wish to explore a vocational route throughout Key Stage 4, but it is also suitable for other learners who want a vocationally focused introduction to this area of study. History of Art: Students will study artists and artworks from a range of times and places and will then develop their visual language by making artworks in response. Craft and Design: Students will explore techniques for designing and making using drawing, printmaking, fabric, felt, clay, batik, Photoshop, Illustrator and other processes. Gastronomy: We will start by introducing basic skills in food preparation and continue each term to develop those skills within different themes e.g. summer salads, celebration food. I think this is an exciting model: pre-GCSE options that allow teachers to devise interesting courses that are not confined by a syllabus. In addition to the range of subjects and the Trivium-fueled ‘enacted curriculum’ – the way subjects are delivered in the classroom – we have committed to retaining some other distinctive elements of students’ overall curriculum experience. Recently I returned from spending a few days with 150 Year 9 students at the Outward Bound centre in Aberdovey at the south-west corner of Snowdonia. It’s the eighth year my school has run this trip; we’ve got a strong relationship with the organisation and its become an embedded feature of our KS3 curriculum. Personal challenge and cultural capital. The sign in the driveway to the centre says that it was founded in the 1940s “…as a challenge to youth on the threshold of [adult]hood, by God’s help to seek through the sea and the hills, the joy of striving, of achievement, of selfless duty and service”. The richness of the learning experience is phenomenal, not only in terms of personal development but also in terms of cultural capital. There’s a debate to be had about the domain-specificity of ‘grit’ and other dispositions – we’re not kidding ourselves that students can automatically struggle through maths problems at school any better just because they developed some resilience in an outdoor setting. However, we know that they’ve learned about themselves, their country and the countryside first hand; they’ve experienced life without being wrapped in cotton wool, got dirty, wet and cold and seen the stars. Every inner-city kid deserves this experience – in our view. We can’t persuade every family to let their children go – but we try very very hard! And it’s free – a locked-in priority in our annual budget. We’ve got a slightly smaller Outward Bound programme in Year 8 and, coming soon, a Year 12 programme too. 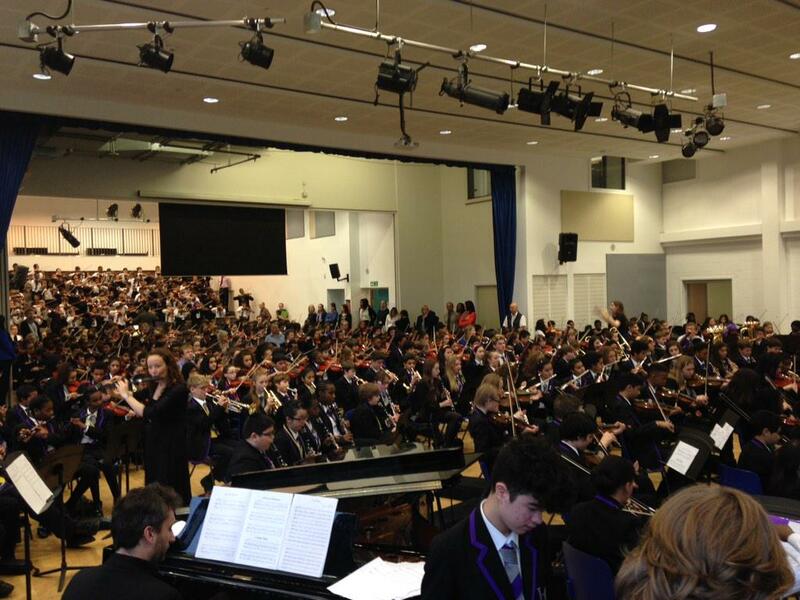 600 KS3 students performing together – it’s quite something! I am very fortunate as Head to have joined a school that hosts the sensational Music in Secondary School Trust programme, sponsored by Andrew Lloyd-Weber and some other key benefactors. 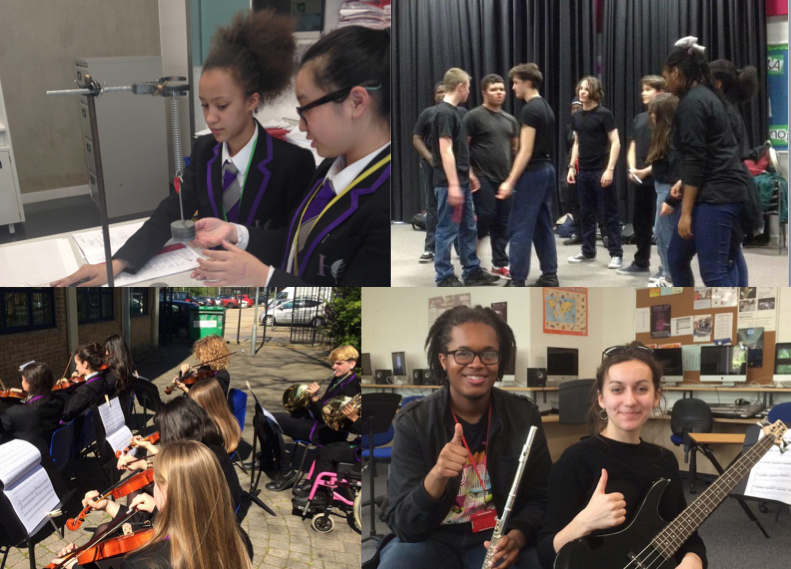 This gives us about £150K a year to ensure that all students at KS3 have an instrument – a violin, viola or flute – and that we give free tuition to everyone. In conjunction with a part of the school budget, we fund a Saturday school and a specialist programme for more advanced musicians on a range of orchestral instruments. Our philosophy is that music is transformational – so everyone is a musician. It’s not without pitfalls but the outcomes are extraordinary – students from all backgrounds playing classical music in small and large ensembles throughout the year with a few very special showcase events. From September, we’ve opted to give all students two hours of music a week at KS3; this will include the instrumental tuition and more typical music components – singing, composition and so on. We’re committed! For me, the curriculum model overall is very exciting. It’s aspirational and broad; designed to give all children the opportunity to develop the knowledge, experience and personal qualities that will lead them to have rewarding and fulfilled lives as principled global citizens – not to mention a jam-packed Baccalaureate transcript when they leave us. We’re serious about that too. « Progress 8: Looks like Data Garbage to me.